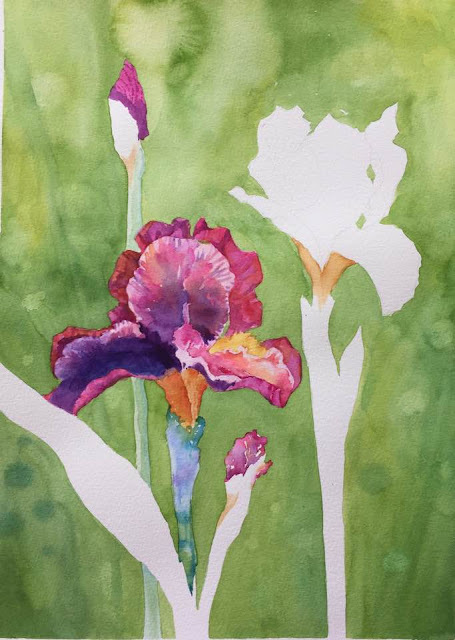 Mardi Gras Iris - completed! Finishing "Mardi Gras Iris," which I’d shown in my previous post, meant identifying the colors I used when starting the painting several months ago. I'd neglected to keep color notes, so I had to do some paint swatches to be sure I'd get them right. I wanted to stay with mostly transparent, and staining or semi-staining colors. 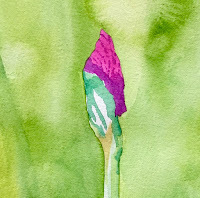 Holbein's "Opera" -- an almost neon-bright pink that is fairly easy to identify -- was the main color I used in the center iris blossom. Pigments used in manufacturing Opera make it a 'fugitive' color (unstable, and not very permanent), so I wouldn't normally use it in focal-point areas of a painting. But in this painting, I was experimenting with a more vivid palette and wanted to determine how Opera interacts with other pigments. 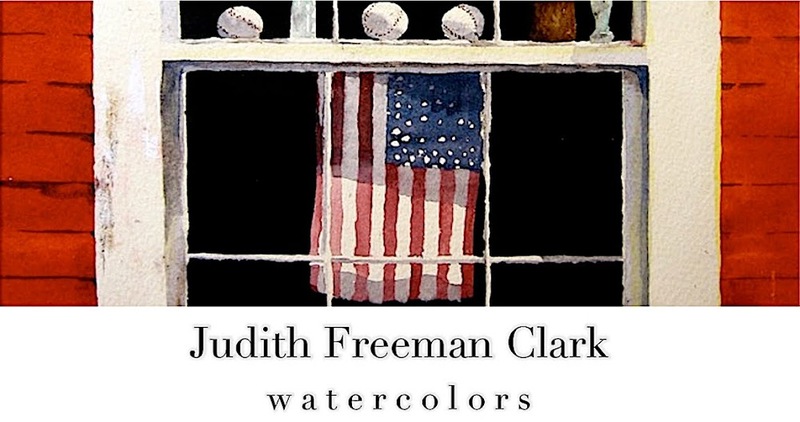 I do know other watercolor artists use this color to good advantage, especially in detail areas. After a little experimenting with color swatches, it was clear that I'd used "Winsor Blue GS (e.g. 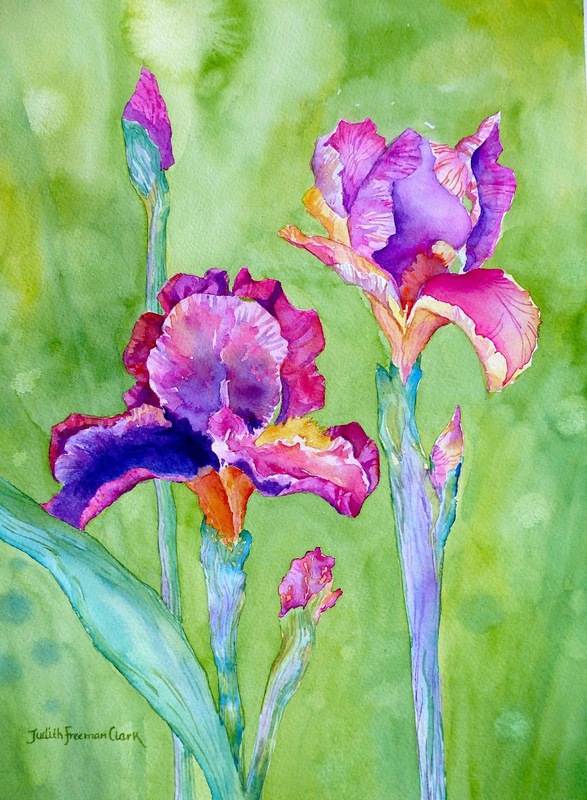 'green shade'), " Dioxazine Violet," and "New Gamboge," along with "Transparent Orange," "Quinacridone Gold," "Permanent Rose" and "Quinacridone Magenta," all of which are Winsor & Newton, professional-grade paints. 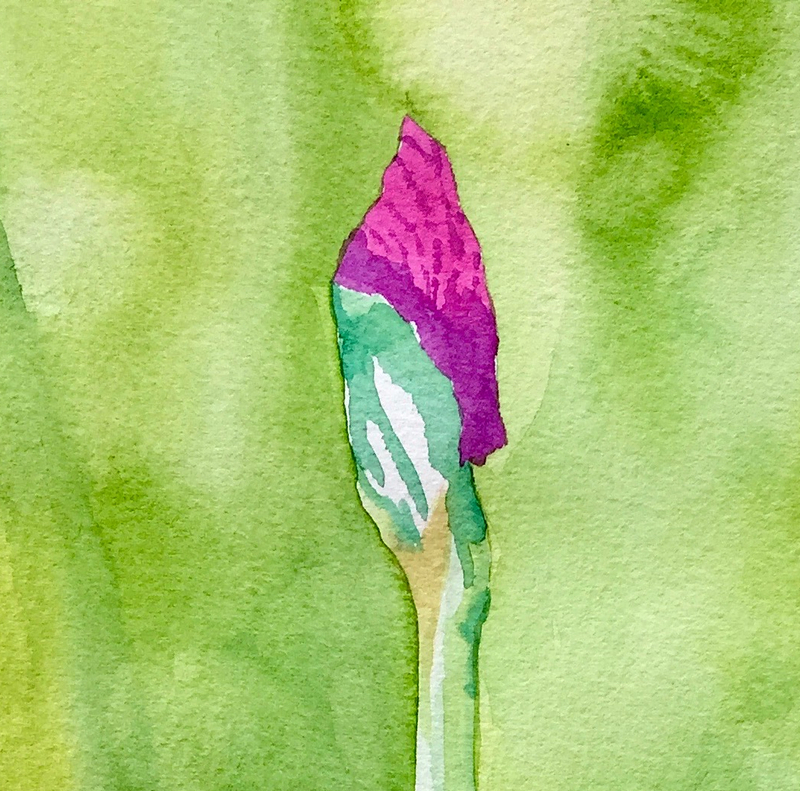 I did the background in a blended wash, using Winsor & Newton's "Permanent Sap Green," "Cobalt Blue," and "Green Gold," making deliberate use of "runs" and "blooms" (detail, above left) in the process of laying down these washes. Also, I lifted small spots of color (detail right) using a wadded-up paper towel, still allowing the paint to blur and blend naturally. The completed painting (below) shows what a visual impact results when you use intense, saturated colors throughout all areas of a painting. It makes a bright and colorful statement at the tail-end of a snowy New England winter. • A floral that I'm approaching with a question: "Can this painting be saved?" 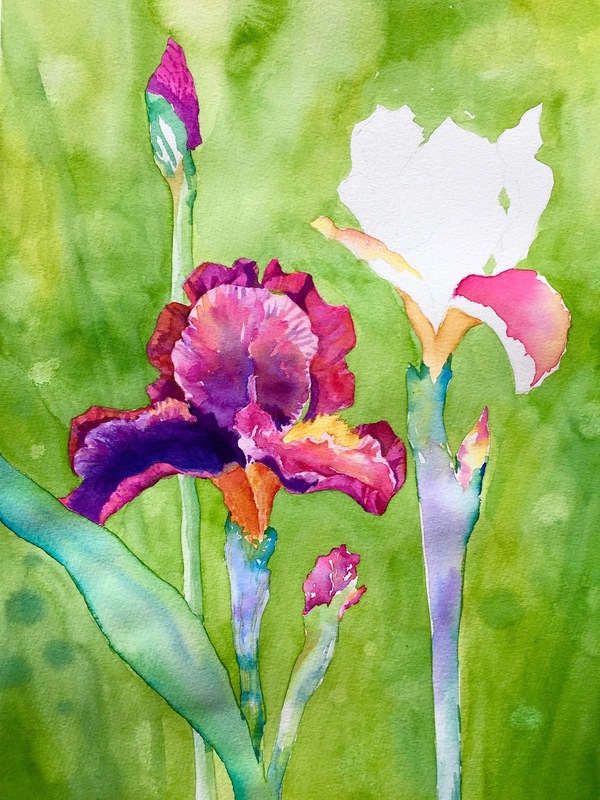 The tentative title is "Mardi Gras Iris." It measures 11" x 15." 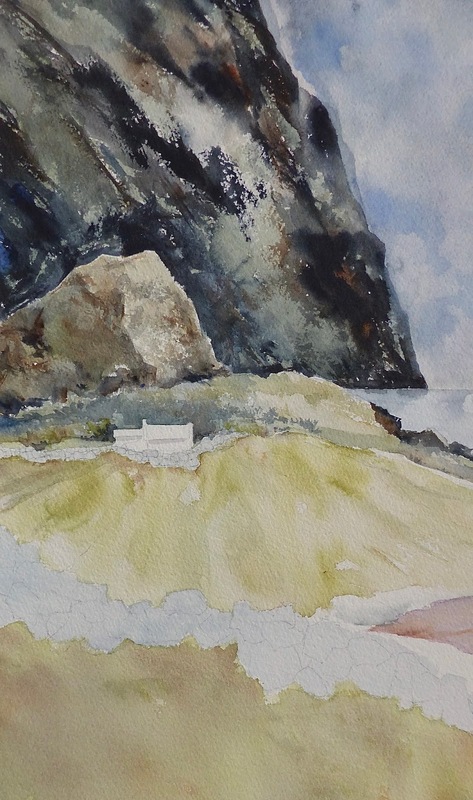 • The vertical work below, "Lochside Croft," 11" x 20" is actually the left-hand side of a large, square-format painting. Because it was not working out, I cut it in half. After I did, I sold the right-hand side! I'm hoping this one can be salvaged... time will tell.